We offer a wide selection of premium menswear and specialize in providing stylish tuxedos for weddings and special events. We know that not only does your tuxedo need to represent your personal style, but provide a perfect fit, and in the case of a wedding, compliment the bridal party. The big day always seems to arrive sooner than expected, and it’s important that you’re prepared to look your best when the wedding day comes. Ideal Bridal and Dry Cleaning has everything you need, from wedding tuxedos and accessories for you, to weddings suits and formalwear for your groomsmen. As an official provider for Jim’s Formal Menswear, we can offer tuxedo rentals from the leading designers, and with our 25 years of experience performing custom tailoring and alteration services, we can make sure you and your wedding party look stunning with perfectly-fitting attire. 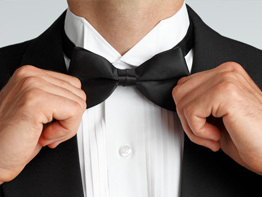 What good is a tux without the matching tie, bowtie, cummerbund, suspenders, socks, or vest? Ideal Bridal and Dry Cleaning provides a full range of tuxedo and suit accessories to complete whatever look you’re trying achieve. We offer complete bridal services for the bride, groom, groomsmen and bridesmaids. We know the work doesn’t stop once you’ve found the perfect tux. 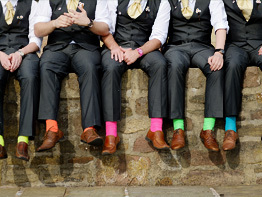 You need to ensure that your groomsmen are properly outfitted in matching stylish suits, and that their attire is perfectly tailored to fit each unique body type. That’s why we in addition to our tuxedo rental services, we offer complete solutions for your groomsmen, including all accessories. Whether you’re attending a prom, reunion, wake, ball, formal, or any number of other special events, we’re sure to have the affordable options you need to look your best. Even at short notice, we can provide custom tailoring and alterations for any of our many suits and tuxedos, and we have the choices you need to look great at any event. For more information about our tuxedos and suits for rent or sale, to schedule a bridal consultation where we can outfit your entire party, or to get custom alterations for your existing menswear, contact us today. We’re here to help you look your best! Our store is conveniently located in Livonia, near Novi, Northville, Westland, Farmington, Farmington Hills, and the surrounding Southeast Michigan areas.